Of course we’re not talkin’ about a literal resurrection, but the resurrection of Tom Petty’s music, his voice, his life-force as it were, via his music, all via the box set An American Treasure, released almost a year to the day since his death. An American Treasure is a different kind of box set, with no real precedent. Most boxes are arranged chronologically or group songs according to type. For example, Playback, Petty’s 1995 box set, had a CD of hits, separate CD’s of outtakes, etc. 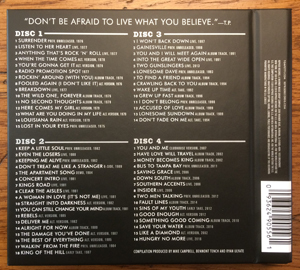 Some boxes have studio tracks separated from live tracks. Songs on most box sets are selected by the artist and/or record company. Treasure, on the other hand, is a gumbo of selections, which, on first glance, has no real rhyme or reason apart from a loose division by decade. But within those decade divisions there’s no order to the chronology and there are album tracks next to previously unreleased outtakes next to live songs. Initially, this bothered me…there’s no strict structure, no properly arranged strict historical progression! As a librarian, there’s a part of me that cries out that this is wrong! Fine, if it’s a personal mix, but this is an official public release, with all the posthumous posterity that entails. Ah, but there’s the thing: it is a personal mix and a mix so unique in its origins that it can get away with the way it’s constructed. 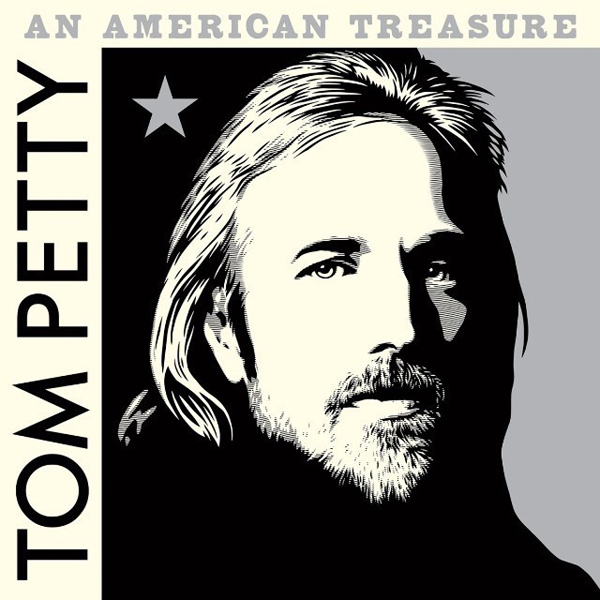 Each track was selected by a team comprised of Petty’s wife Dana, daughter Adria, bandmates Mike Campbell and Benmont Tench, and longtime Petty friend engineer/producer Ryan Ulyate. These are songs that are favorites of that team, songs they felt were deserving of wider recognition and as Ulyate has said, songs they put to the test of “would Tom have included it?” It was then sequenced for flow, assumedly either by committee or by Ulyate. Looking at the box set objectively, as an outsider, does it deliver? Is it a good overview, a good portrait of the artist? The short answer is yes, with a caveat. 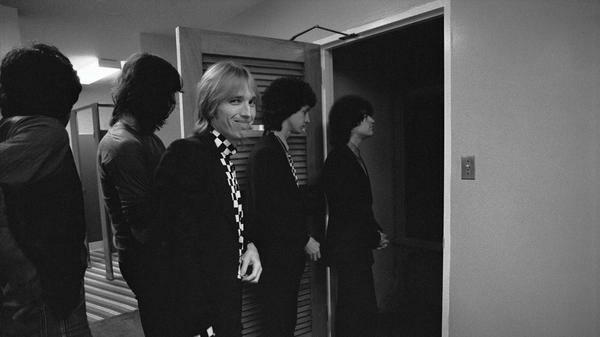 Undoubtedly, given unlimited access to Petty’s “vault,” everyone would choose different tracks – if nothing else, different deep album cuts. For example, “Rockin’ Around With You,” a nice but relatively slight song in his catalog, might seem like an odd choice. Yet, the liner notes reveal that it was one of the first songs Campbell and Petty wrote together. So, it could be said that the people who were close to the artist have more “weight” attached to their picks. Or at least that their picks are more interesting for the listener, knowing the contexts from the liner notes. I would never have given “Rockin’ Around With You” a second thought but will always see/hear it in a different light now. The version of “Surrender” which kicks off the set, is being touted as one of the great lost Tom Petty and the Heartbreaker’s cuts. It saw the light of day as a bonus track years ago, but this version has a snappier drum sound and overall, more spark. As a song, even though it never made it to an album, it stands equal to anything else from those first few records. “Surrender” always reminds me of “Magnolia,” which was on Petty and the HB’s second album, as if a little of the DNA of both songs got mixed. The song I was most looking forward to is truly one of the great lost Petty songs, the southern soul “Lost in Your Eyes,” recorded pre-Heartbreakers in 1975 by Petty’s Mudcrutch band. Actually, it did surface on a Don Johnson album in the mid-80s, but the less said about that cover, the better. I’ve had a sub-par recording of this song for years and was looking forward to hearing the officially released version, sparkling cleaned-up sound and all. Surprisingly, the version on An American Treasure is a different version than the one I’ve been listening to all this time. The vocals are more ragged and there’s the addition of horns. The horns are a nice touch, not overbearing, but rather fleshing it out in more of a subtle classic Memphis soul feel. Paired with Petty’s wounded yet resilient vocal, the result shows just how spot-on and skilled he was even in the very early days. For some reason, though, the horns almost sound like an added afterthought and oddly, the booklet gives musician credits for the song, but doesn’t list any horn players. Were they added/overdubbed later? Listening to the alternate version of “You’re Gonna Get It” is almost disorienting, with a previously buried string section now brought way up in the mix, transforming the song into some kind of punk psychedelic baroque rock song. “Even the Losers” is represented by a live acoustic version from 1988. A wistful song, it’s tailor-made for the intimacy of this stripped-down take, complete with mandolin and tinkling piano. Even the crowd participation, which can so often distract during a quiet song, fits in well here. “Don’t Treat Me Like a Stranger” is a double-lost song in some ways. 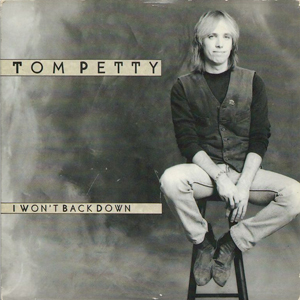 The b-side to the 1989 UK single of “I Won’t Back Down,” it for some reason didn’t make it to the 1995 Playback box set. Luckily, this embodiment of “the big jangle” (as one of the Playback CD’s was titled) wasn’t totally forgotten. “I’ll fight like a tiger if you put me in a corner,” Petty sings in this panoramic track produced by Jeff Lynne. There were a few tracks left off the ultimately flawed (but still good) Southern Accents which may have made the album more in line with its original vision. “Trailer” was the main one, but the previously unreleased one here, “Walkin’ From the Fire,” is another, with its slide-guitar draped, Stonesy/Creedence Clearwater Revival flavored dichotomy of moodiness and rocking out. Similarly, the alternate version of “Rebels” included is a revelation musically. Even though I’ve never liked the lyrics much, the separation of instruments on this new mix beings new life to the song. The drums sound great and the organ is more prominent, as are the “Hey hey hey!” vocals, which are raised very high in the mix as the song fades out. Somebody having fun behind the mixing board, but it works. I’m sure as I listen more, other tracks will stand up and demand to be noticed. Because, what comes through on An American Treasure is just how much of a songwriter he was. 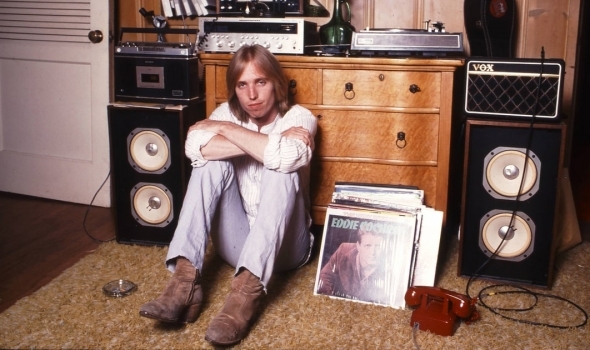 I mean, most box sets you’ve got some outtakes and alternate versions, some live songs, maybe some unreleased tracks – Petty coulda filled entire additional albums with the number of unreleased songs he had…and they would have been quality albums. I’m sure if he had survived, there would have been at least one more box set down the road. It would have been a different beast, but I’d wager a lot of these cuts would have been on it. Due to that deep well, his legacy of song will continue for quite some time and that’s something to look forward to.